The Commission internationale de l’éclairage, CIE, is releasing new documents on Human-Centric Lighting. The group, known in their English translation as The International Commission on Illumination, notes the types of issues discussed in this forum a couple months ago. The two new documents will address how to quantify the human non-visual response to illumination (presumably in the same sort of statistically average way as the CIE chromaticity diagrams) and how to identify the human factors that are influenced by non-visual illumination. Just to clarify, “non-visual” in this context doesn’t mean invisible or outside the spectral response of the eye. 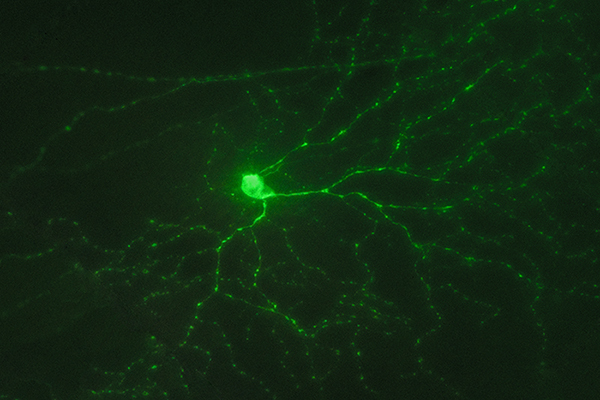 It refers to light sensed by neurons that are not involved in image formation — that are not rods and cones. The primary receptors involved in the non-visual response are called intrinsically photosensitive retinal ganglion cells (ipRGCs). They have a spectral response that overlaps quite significantly with the action spectrum of green cones. An intrinsically photosensitive retinal ganglion cell, which is the primary receptor targeted by human-centric lighting efforts. Image from Ning Tian, M.D., Ph.D., photographed by Bryan William Jones, Ph.D, via webvision.med.utah.edu. As with any field on the edge of knowledge, what we don’t know far outweighs what we do know, but the CIE is looking to turn that around. It would be nice to be able to design human-centric lighting based on sound understanding of its physiological effects. I’ve had the good fortune to interview half a dozen or more Nobel Prize winners, either before or after their awards. They’ve been universally humble, informative, and courteous. If each of them were incarnated as a television avatar, they’d all be Fred Rogers, putting on the slippers and sweater and settling in to chat about reaction chemistry, electron degeneracy pressure, optical trapping, whatever. Monday of this week we got a little more of the same at the CLEO Conference opening plenaries. Stefan Hell and W.E. Moerner both gave very informative discussions about their super-resolution microscopy techniques. Then Eric Betzig took the podium, and step aside Teresa Giudice, because the real Nobel Prize Winners of Ashburn, Virginia was on the air. “The Nobel committee made a f***king mistake,” he said. Tell us how you really feel, Dr. Betzig. It was rather refreshing, especially because I happen to agree with him about the particular mistake he was referring to at that moment (I’m sure that will make him feel better). The mistake was the omission of Mats Gustafsson’s work developing Structured Illumination Microscopy. Mats himself was not eligible because he died of brain cancer in 2011, but having reported on both his and Stefan Hell’s work when they were first making news and beyond, I thought both developments deserved to share the Nobel. After that, I have to admit that the field was so crowded with super-resolution techniques that I wouldn’t have been able to pick out PALM, STORM, or NSOM from whatever other alphabet soup localization methods were being developed; so I’m glad people much smarter than me were able to pick out Drs. Moerner and Betzig for recognition. But back to Betzig’s point: there are a variety of methods out there, including those honored with the Nobel Award, but we can get so caught up in the race to better resolution that we forget to evaluate other aspects equally (or more) important for performance. Specifically, if the goal is to measure processes in living cells then many of the super-resolution techniques aren’t optimum because of long exposure times, high illumination intensities, and/or the need to fix (i.e., kill) cells. According to Betzig, although SIM may not be able to quote the resolution numbers of some of these other methods, SIM’s performance in live cell imaging speaks for itself. The structured illumination microscopy image on the right shows far more detail than possible with the conventional fluorescence image on the upper left, even when computationally enhanced as in the lower left. Image courtesy of the Singapore Agency for Science, Technology and Research. Betzig also lamented the fact that his colleague Harald Hess — who had essentially shared equally in the work they did developing localization microscopy methods — was unable to share in the prize. And when it comes down to it, Betzig’s complaints really come down to one thing: the Nobel Award is limited to three recipients, and, while the Nobel is designed to recognize outstanding achievement, it has the unintended (and sometimes undeserved) consequence of classifying other work as less outstanding. Of course, this isn’t limited to Nobel Prizes — the same classification goes for sports figures, novelists, movie directors. It’s the Oscar-winning film that gets re-booked into theaters, while other equally good or better films don’t get the extra boost they deserve. There is a fine line (and some element of chance and, yes, human error) that separates the “winners” from the “losers.” Betzig brought to our attention how arbitrary that line is and is encouraging us not to allow ourselves to relegate SIM to second-class status just because it wasn’t acknowledged with a Nobel Award. And if it takes a little colorful language to bring that to our attention — Hey, I’m not going to argue with him; he just got a Nobel Prize. 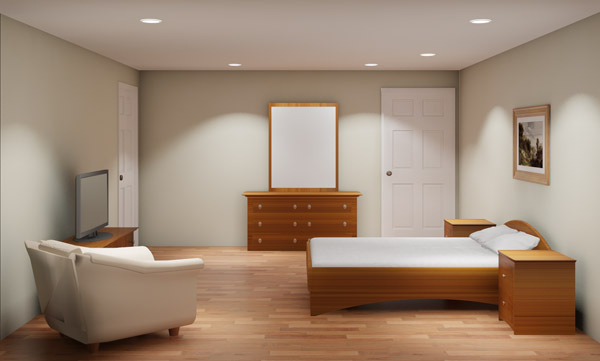 By now even the most isolated consumer has at least heard of LED lighting. LED replacement bulbs are available in any hardware store larger than a closet. The case for the economics and quality of solid-state lighting has been won. Now the industry can concentrate on bringing true value to LED lighting. That value will not come in the form of lower energy use; it will come in the generation of light that enhances the human experience. That means influencing some aspect of human comfort, health, or behavior by producing and modifying light’s intensity, spatial and angular distribution, spectral content, and possibly other characteristics. Before LEDs we had only limited control over the characteristics of light. Now we have nearly infinite degrees of control. With this control the question becomes: What is ideal lighting, and how can we produce it? Philips LED lighting offers teachers the option of four pre-set lighting scenarios, ‘Normal’, ‘Energy’, ‘Focus’ or ‘Calm’. There’s a positive response, but what does it mean? Courtesy of Philips Lighting. The argument put forward by the presenters is that they are already proceeding with human-centric lighting projects designed to optimize or improve some aspect of human behavior. Stan Walerczyk introduced the new solid-state lighting at the Seattle Mariners’ stadium — the first Major League Baseball stadium to make the switch — which includes (in the home team locker room only) features to tweak circadian rhythm for optimum alertness at gametime. Doug Steel talked about the growing body of knowledge linking various health conditions with light exposure — and the corollary that light exposure can potentially improve health outcomes. Professor Robert Karlicek described methods for integrating “non-invasive” sensors into lighting systems to produce light optimized for a given activity — hands-free because the sensor’s system autonomously categorizes the human activity. Mike Lambert described some human-centric lighting pilot projects in schools, including a school for autistic children. The message is that light is already being used in innovative ways to influence human health, behavior, and comfort. In what ways do the visual and non-visual light receptors influence human behavior, mood, and health? It’s likely to be a very complex answer with primitive roots. That is, the intrinsically photosensitive retinal ganglion cells (ipRGCs) are very highly conserved, in biological terms. That means they appear even in “primitive” organisms only distantly related to humans, which points to a)their early origin and b)their importance to survival. That early illumination response had nothing to do with the human brain, as it was around far before there were any humans (or, for that matter, any brains). So there are going to be some very basic biochemical responses to light that are far beyond our conscious (or even unconscious) control. On the other hand, the human brain does a really good job of processing and manipulating sensory response. Basically, we can convince ourselves we feel one way when our body is telling us we truly feel something completely different. And that’s even before we introduce “thinking,” which makes everything more complicated. Thus, the complex answer with primitive roots. Light influences the biochemistry of the brain, endocrine systems, metabolic processes, and — well, who knows where it ends? Courtesy of Nat’l Institute of General Medical Sciences. How do we go about finding the answer to the previous question? One answer, proposed by Doug Steel at the SIL workshop, is to create environments where users get to choose their own lighting characteristics and then simply monitor what they do. He believes there is a natural tendency for people to drift away from their initial preferences — what they believe they like — to lighting that maximizes whatever it is they’re trying to optimize. If engineers partner with clinical professionals (many of whom are being dropped by pharmaceutical companies) then he believes these types of studies will identify (or at least illuminate ) the influence of light on human activity. On the other hand…there are so many confounding factors that the mechanisms might be hidden beneath layers of competing biochemical, emotional, and cognitive mechanisms. Professor George Brainard emphasized that point, reminding the panelists that there’s a well-developed successful path for performing this sort of research, progressing from animal through clinical studies. Although I don’t recall anyone explicitly stating this, the panelists’ consensus seemed to be that a)there are already companies out there claiming either specific or nebulous health effects of their particular lighting system, and b)traditional scientific discovery will take too long. So we should do what we can to provide at least some sort of scientific investigation into the effects of lighting, and we should do it right now. What makes good lighting? In an elementary school classroom is the good lighting that which maximizes student performance or that which minimizes behavioral problems? In the work environment, is it that which maximizes worker productivity or worker comfort? If lighting makes me feel keyed up, as if I’ve been physically active, am I likely to eat more, even though I’ve been sedentary? Is lighting that makes me happy better than lighting that makes me more alert? And, distinct from those types of questions, there is the layer of light and health. You can imagine a scenario where I may feel good and work hard under certain levels of illumination, but that ends up triggering some photosensitive biochemical pathway that begins tumor growth. My concern is that human studies right now will be almost necessarily one- or two-dimensional: looking at the effect of light on one or two aspects of human comfort, health, behavior, or activity. It’s likely that the complex structure of the human brain is reactive to illumination in many, perhaps contradictory, ways and if we really want answers we’re going to need to take as comprehensive an approach as possible. The Human Centric Lighting Society is working on these sorts of questions, and you should take a look at their site if you want to get up to speed. A few years ago XVIVO and Harvard University released a video of a scientific visualization entitled, “The Inner Life of the Cell.” I wasn’t a big fan. It was a fairy-tale vision of cellular activities. If you saw a simulation of traffic flow on the highways and every vehicle in each lane was going the same speed, maintaining proper following distance, signalling and changing lanes only when necessary, merging and exiting with decorum—it might be nice, but it would be so fanciful that it would do more harm than good if you were trying to understand highway traffic in the real world. When you look at real-world traffic, you have difficulty believing anyone can travel the highways safely, but the simulation would make it hard to imagine there could ever be such a thing as a freeway collision. A scientific visualization should induce a mental model that catalyzes an improved understanding of reality, and the 2006 simulation failed. Of course, a simulation like this is going to be unrealistic. Molecules aren’t distinguished by hues, atoms don’t remain stationary with respect to their neighbors, and there’s no classical music soundtrack in a real cell. But the 2006 simulation was so far removed from reality that (in my opinion, of course) it served more to confuse than clarify perceptions about molecular activities in a living cell. My biggest peeve: all the molecules were shown in stately glides as if a miniature synchronized swimming team was displaying the results of years of practice. On those scales, the “aqueous” environment behaves more like peanut butter. Kinesin molecules grab onto microtubules and pull because they have to to make it through the thick goop through which they travel, and none of that difficulty was shown. A lot to admire in the new XVIVO/Harvard scientific visualization of molecular activities within a living cell. Now the same scientific visualization team has created a new video, “Inner Life of a Cell—Protein Packing.” This one is so much better. It’s a much more crowded world, and the actions of proteins are limited by interference from all their neighbors. None of the small molecules are shown (not a criticism—if water, ions, and sugars were visible you wouldn’t be able to visualize anything through the resulting mess), but many of the proteins are shown. Of course it’s not “accurate”—it’s a visualization!—but this one is much more representative of the kind of confused and crowded environment within living cells. The new simulation makes it much clearer that the normal processes of life are challenged with every motion, and the new video makes it easier to be awed by the mere fact that we are alive. Heartily recommended! From the day I began working as a science writer (starting as a “hobby” while I was a gainfully employed optical systems research engineer) I’ve covered new breakthroughs — discoveries or inventions that have revealed or used new principles or techniques. The challenge of covering that “beat” is that the mere fact that a discovery or invention has been made says absolutely nothing about the use or application of the advance. So there’s a bit of a disconnect between news of technological or scientific progress and the availability of the fruits of that progress to a wider community. But there is a definite process that these things tend to follow: initial work–>use by a handful of specialized practitioners–>availability of the method to a technically capable general population–>accessibility to all. Of course, not all breakthroughs make it through all these stages, and one of the most fascinating aspects of following science and technology is to predict which ones will hit the big time. Applying that model to the development of general lighting with LEDs, the first breakthrough was simply crashing through the performance, cost, and reliability (i.e., quality assurance and product validation) barriers to bring solid state lighting to market. Any walk through a big box hardware store will demonstrate that basic LED technology is now in the fourth stage of development. The subsequent stage is to realize even more value from LED lighting by incorporating it into an overall control system, i.e., Smart Lighting. I’d say that’s at the third stage (perhaps on the cusp of the fourth), where folks who are generally capable around technology can now incorporate advanced controls into their lighting systems. Proving the point are commercially available systems such as the Hue system from Philips bringing those capabilities to the general consumer, and companies like Redwood Systems, that offer integrated controls solutions to commercial and industrial customers. Although the market penetration for LED lighting in general is still proportionally very small compared to the overall industry, that’s now a marketing challenge more than a technical one. The next wave in LED lighting is to start to apply the inherent controllability of solid state lighting to use light to define spaces and optimize suitability of illumination for any circumstance. Specifically, LEDs offer an unprecedented degree of control over the distribution, spectrum, and intensity of light in a space — including the ability to vary those parameters over time. At the Strategies in Light Conference, Hans Nikol, VP for Strategy and Innovation at Philips Lighting, discussed how a significant percentage of the market for the Hue LED lighting system is driven by teenagers — looking to show off the cool lighting at their homespun raves (if anyone uses that word any more). But that’s not the kind of value that’s going to drive widespread adoption of solid state lighting. What’s needed is a way to identify specific benefits of lighting control — aspects of illumination that improve human health, productivity, or perhaps even some more nebulous sense of well-being. Also at Strategies in Light, Mark Rea, Director of the Lighting Research Center at Rensselaer Polytechnic Institute, spoke about various ways to quantify the value added by the ability to spectrally and temporally tune illumination. He is pushing the industry to help identify quantifiable metrics that can be applied to commercial, industrial, educational, and domestic environments to present a clear story of the value of controlled illumination in those environments. Of course, identifying a metric is different from establishing the connection of that metric to human health and performance. That work is in its early stages, with the exception of a few tantalizing tidbits. But enough work has been done to understand that human well-being, alertness, and productivity are influenced by lighting choices. Although some may quibble, I’d contend that this field is still at the stage where researchers are making their fundamental discoveries, and significant expertise is necessary to investigate and apply these illumination methods. It’s also my contention that herein lies the true value of solid state lighting. Without the ability to control illumination, it didn’t make much sense (and was difficult to do anyway) to investigate the effects of various illumination levels, colors, and timing. Now those investigations are underway, and the results should drive the value of LED lighting well beyond that of simply upgrading incandescent light bulbs. Copyright © 2019. Scientific Seen All rights reserved. | Powered by WordPress | tpSunrise theme by Tekpals.